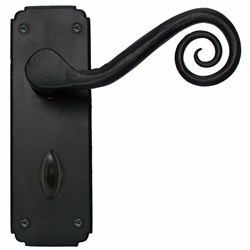 Antique Black Monkeytail Handles. Supplied in all door handle variations. The Monkeytail Lever is part of the Monkeytail lever range by From The Anvil. Internal/external use except marine/coastal environments. The Monkeytail handle is an unsprung lever that is designed for use with good quality sprung latches. The simple backplate design shifts all the focus on to the unique Monkeytail lever that has been drawn from a single piece of steel.